Lake Erie at Point Pelee National Park. How climate change will affect public health, infrastructure, fish, wildlife and the economy around the Great Lakes is the focus of a new North American report released today. University of Guelph professor emeritus Robin Davidson-Arnott is one of a dozen leading scientists and experts from universities and research institutions in Canada and the U.S. Midwest who contributed to the first-of-its-kind report. The report warns areas around the Great Lakes to prepare for the likelihood of more extreme weather events, including more flooding early in the year, more heat waves and drought in hotter months, and less snowfall and snow cover even with more major lake-effect snowstorms. Port Elgin along Lake Huron. 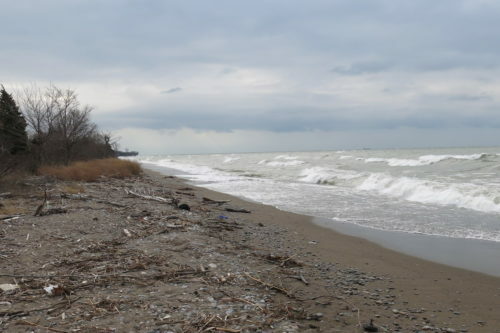 Climate change is impacting coastal erosion along the Great Lakes. The authors say these weather-related changes will affect lake coastlines and the infrastructure, agricultural operations, homes and businesses along them. Beaches, dunes and bluff shorelines will become more vulnerable to coastal erosion with changing weather patterns, reduced ice cover and more frequent severe storms. “The report serves an important function by covering the many things that are needed to lessen the impacts and is a good summary of the various effects of climate change in the region,” said Davidson-Arnott. Retired from teaching in U of G’s Department of Geography, Environment and Geomatics, he continues to study and consult in coastal processes and geomorphology, particularly coastal erosion. Roughly 34 million people rely on the Great Lakes for drinking water, jobs and recreation. Almost one in three Canadians lives in the region. Near Hawksville, Ont. Crop yields could decrease by 10-30 per cent in the Great Lakes region. The report was commissioned by the Environmental Law and Policy Center (ELPC) based in Chicago along with the Chicago Council on Global Affairs. The ELPC educates policy-makers and the public on changes affecting the Great Lakes and actions needed to protect natural resources. 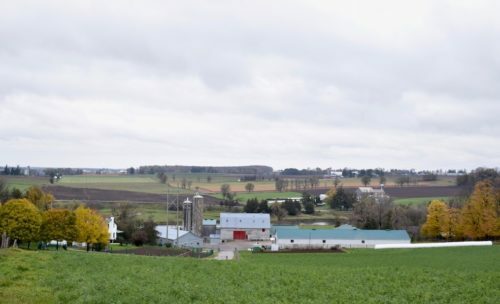 Davidson-Arnott said the report focused mostly on the American side of the Great Lakes region but is pertinent for Ontario cities and rural areas. The report will help those communities develop policies to mitigate the effects of climate change, he said. 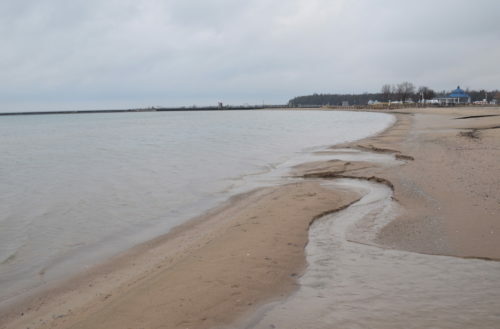 Besides coastline impacts, says the report, warming trends have increased bacteria levels and algae blooms in the lakes, impacting drinking water. Changes in seasonal precipitation are already affecting farmers, delaying planting and leaving crops more vulnerable to severe heat later in the growing season. Crop yields are projected to decrease by 10-30 per cent in the coming decades within the region. The report also includes new policies to reduce greenhouse gases and other pollutants that contribute to global warming.